WHAT LOCATIONS CAN BE LOOPED? ← State of the state? Well-looped, thanks! 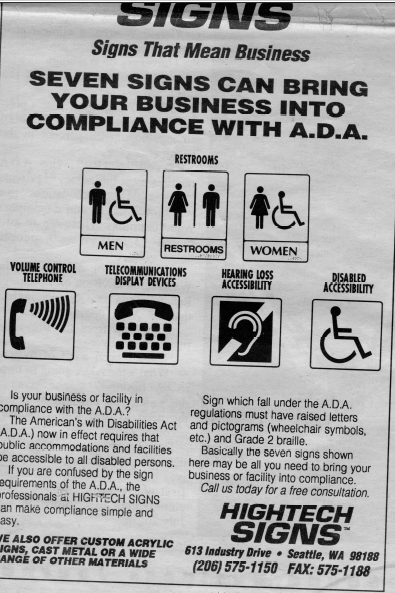 This 1992 ad from a Seattle paper reminded businesses of their need to provide signs showing their ADA compliance. We still stress the need for hearing access signs and are thrilled to see them. Some of us remember the day in 1990 the ADA was signed into law by George H.W. Bush. We also remember the opposition from businesses and others who were concerned about costs, rules, big government, and so on. But mostly we remember feeling thrilled that now the law reinforced what we already knew: Everyone counts. Everyone matters. Everyone’s contributions should be expressed to the fullest—with assistance and accommodation where needed, with removing barriers whenever possible, with respect and dignity to all. The ADA has since been used to litigate (or ensure) thousands of times to secure access: curb cuts, ASL, CART, open and closed captions, ramps, parking, employment discrimination, TTYs, Braille…the list goes on and on. We’ll keep advocating until ADA hearing access is automatic–a given, not something to be begged for or demanded, but rather an integral part of serving all Americans in their work, play, and civic lives. Hearing loops are one way to do that, and loops are arriving in more and more places. Happy 25th Birthday, Americans with Disabilities Act. May you live long and prosper! Hasn’t this been wonderful……..A law that has since been so rejousfull… ………….